← Wow! Talk about some knitting! Posted on March 5, 2007	by Linda S.
I was in Hobby Lobby the other day and came across their yarns that w ere on sale. I don’t usually use the bright colors and eyelash frou-frou yarn, but since it was regularly $7.94 a skein and on sale for $2.14 a skein, I thought why not try it. It’s easy to work with and has a silky feel, so I made a scarf and small purse in a simple garter stitch, thinking of our great-granddaughter. The purse will have a fancy button closure and I haven’t decided whether to put fringe on the scarf yet. Any suggestions? 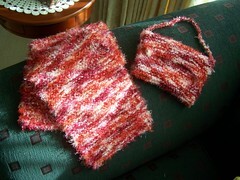 This entry was posted in Handcraft, Handwork, Knit. Bookmark the permalink. Where can I buy this yarn? Hobby Lobby is out. Thanks.